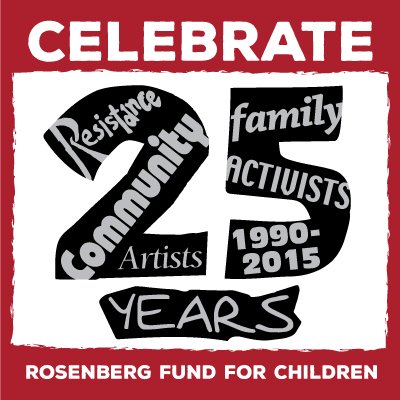 Celebrate the RFC at 25 & Artists as Activists on Oct 17! 2015 is the RFC’s 25th anniversary year. This extraordinary project—which only exists because of the generosity of tens of thousands of concerned people—has grown from funding summer camp for two children of a political prisoner in our first round of grants, to our plan to award $370,000 in 2015 to help hundreds of kids across the U.S. who are living through similar nightmares to what my father and uncle experienced as children. Read more about Celebrate the RFC at 25 & Artists as Activists on Oct 17!